"This is a tasty dish that never fails to impress here in Australia!" Heat olive oil in a skillet over high heat. Add beef and cook until browned, about 2 minutes. Transfer the beef to a bowl and cover with plastic wrap to keep warm. Reserve the oil in the skillet. Reduce heat to medium, then stir in the onion and garlic, and cook until transparent, about 5 minutes. Toss in the mushrooms, red peppers, and yellow peppers and cook until tender, another 5 minutes. Stir in the tomatoes and paprika; bring to a boil over medium-high heat. Reduce heat to low and simmer until sauce thickens, about 5 minutes. 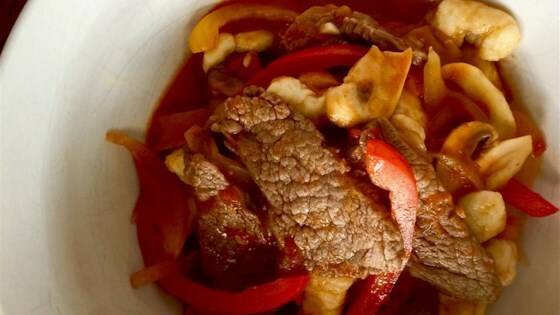 Combine the beef with the tomato mixture and stir. Not crazy about the gnocchi, would try broad egg noodles next time. Great tasting dish. I followed the recipe but substituted or omitted a few things using what I had on hand. It turned out great and can't wait to eat the leftovers tomorrow. kind of bland. according to the recipe it makes 4 servings i found it to be more like 8 servings.